You’ve probably never heard of Voat, but the free-speech-loving little Reddit clone is the hottest website in Troll City today. 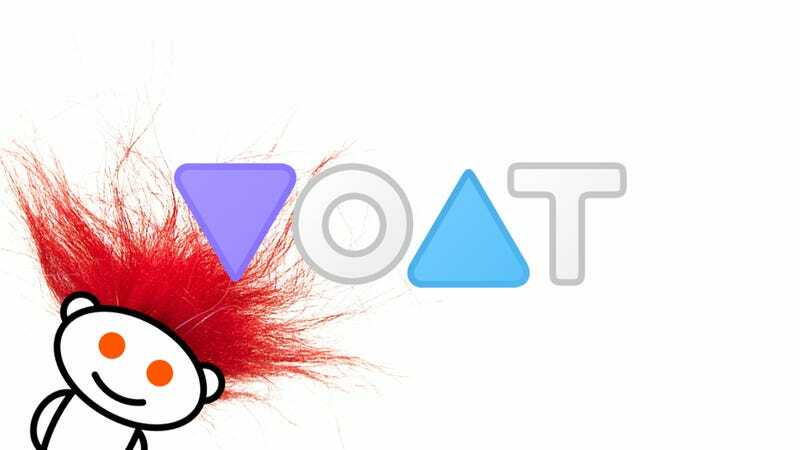 After Reddit officially banned several abusive subreddits, a flood of Redditors fled to Voat, where similar subsites still exist. Voat is now drowning in the traffic and needs Bitcoin to stay afloat. In a sense, Voat set itself up to enable harassment from the start. The site began as a student project in Sweden with the express purpose of allowing any type of content. Voat’s slogan, after all, is “the place where you can have your say™.” The About section elaborates on that idea: “No legal subject in this universe should be out of bounds.” So you want to make fun of fat people? Voat will take your posts. We will ban subreddits that allow their communities to use the subreddit as a platform to harass individuals when moderators don’t take action. We’re banning behavior, not ideas. So Voat is scrambling to give people a forum to behave badly. The top post on Voat at present is about how the site wasn’t prepared for the traffic and users implored each other to send Bitcoin to buy more server space. The only problem is that lots of this new users don’t know how to buy Bitcoin! But they’ll probably figure it out.